As you may have heard already, one critical step in bagel making that separates true New York Bagels apart from the rest is the boiling process. 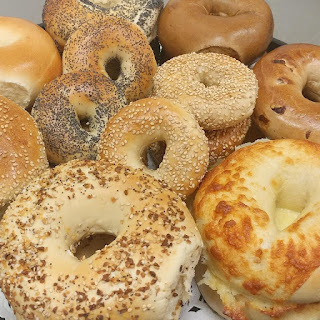 Since 1986, A&S Bagels have been boiled prior to being baked. The process of boiling our bagels prior to baking them creates the shiny crust of our bagels and the chewy interior. The bagel crust created by boiling the bagel essentially creates a wall which restricts the dough under the crust from expanding and provides the foundation of the bagel so that the bagel maintains its shape during baking in the oven. Also, once the bagel is boiled, the activity of the yeast ingredient is diminished. The yeast ingredient during the fermentation stage helps provide the bagel with its flavor and volume (size). Since the dough inside the crust is restricted from expanding due to the crust formation and the cessation of the yeast activity (and because of other factors), the dough inside of the crust of a bagel is denser and chewier than other breads (for example, rolls). Lastly, the boiling process provides a wet surface on the bagel for the toppings and seeds to adhere to. We at A&S Bagels take great pride in every bagel we produce. We are located at 761 Hempstead Turnpike, Franklin Square, New York 11010. We are open 24 hours a day, 7 days a week.